A look at the sweet Hanukkah treat. A serving of fresh oil-fried and jam-filled doughnuts, called sufganiyot in Hebrew, is displayed at the Roladin bakery in Kadima in central Israel. The eight days of Hanukkah are marked by song, prayer and of course, food — especially of the fried variety. The Jewish holiday, which this year begins at sunset on Dec. 6 and ends at nightfall Dec. 14, commemorates the rededication of the second Holy Temple in ancient Jerusalem following a revolt against the Syrian-Greeks. The holiday, also known as the Festival of Lights, celebrates that there was only enough oil for one day to keep lit a light that was supposed to always remain aglow. But that oil lasted for eight days, long enough for more oil to arrive after the temple had been ransacked. To this day, Jews around the world remember the miracle by consuming foods fried in oil. Potato latkes are one of the most popular foods consumed during the holiday, but the fried feasting continues into dessert, too, with the sweet treat known as sufganiyot. The word comes from the Hebrew root for "sponge," where the doughnut soaks up the oil. Sufganiyot (pronounced Soof-GAH-NEE-yote; the singular spelling is sufganiyah) are deep-fried, jelly or custard filled doughnuts, typically topped with powdered sugar. The food originates from Israel, although it’s part of a wider tradition than just Jewish cuisine, according to Poopa Dweck, author of "Aromas of Aleppo: The Legendary Cuisine of Syrian Jews." An employee of Grand Bakery in Oakland, California, injects jelly into doughnuts, or sufganiyot in Hebrew, ahead of Hanukkah. Sunday, Dec. 6, 2015. 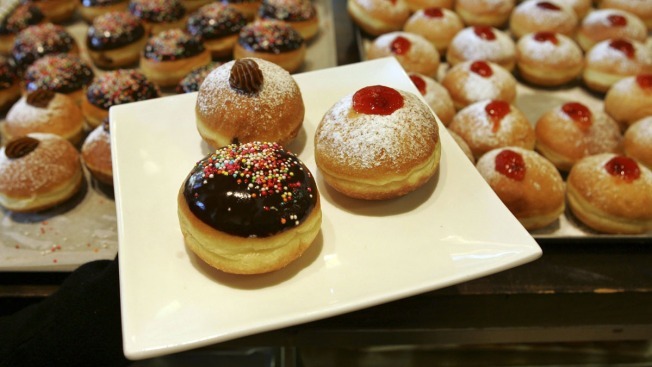 "Throughout the Middle East, (sufganiyot) are sold as street food," Dweck said. "It's not just a Jewish food. It's an Arab food that the Arab Jews enjoy throughout the Middle East. It's not an exclusively Jewish food; it's an Arabic food. It's part of shared heritage." Making sufganiyot can be tricky because it requires patience, as well as extra cookware, as Sheri Silver can attest. Silver, who runs Donuts, Dresses and Dirt, a food and gardening blog, advised buying a cheap clip-on thermometer to make sure that the oil is set to the correct temperature, 350 degrees. "You don't want to burn the dough," Silver said, "but you also don't want it to sit in oil that's not hot enough, because you'll get leaden dough." Another mistake to avoid is crowding the pot with dough balls, Silver said, because the dough needs room, so stick to two or three per pot. "The more pots you have, the better," she said. “I’ll work with three frying pans at a time." Silver said she prefers more tried-and-true sufganiyot recipes, even though food blogging has encouraged people to experiment with traditional foods. "There’s pumpkin-spice everything and Nutella everything," Silver said. "I think when it comes to a fried doughnut, I like to keep it on the more traditional side." Dweck, whose family hails from Aleppo, Syria, makes a Syrian variant dish known as zalabieh, fried pastry balls with a sugar syrup glaze, which are served alongside ataiyef, or ricotta-stuffed pancakes. This year, she is preparing her recipe with low-gluten spelt flour and sweetening it with agave syrup and clover honey, instead of pure sugar. A display of sufganiyot await purchase at Grand Bakery in Oakland, California, ahead of Hanukkah. Sunday, Dec. 6, 2015. Using the agave and honey is "traditional, not trendy, because it’s like the molasses of old-fashioned ways," Dweck said. Dweck said that what’s most important about Hanukkah is family gathering together around the menorah and remembering the miracle of the eight days of oil. 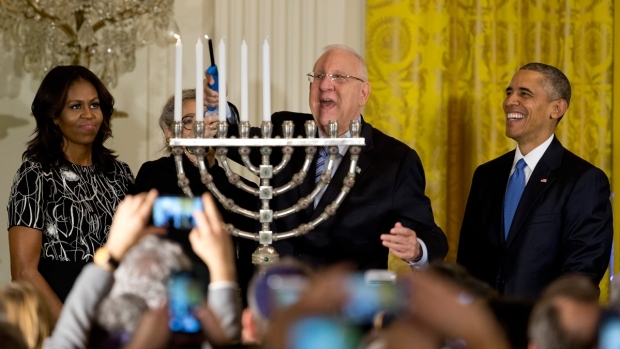 "This year, Hanukkah has so much meaning," she said. "Today, it’s so meaningful to know that miracles do happen. The food is a vehicle to get the message out."